Emeritus Professor, Okayama University, Okayama, Japan. Kimiyuki Satoh’s achievements in the field of photosynthesis research are concisely summarized in an article by Profs. Isao Enami and Jian-Ren Shen (Photosynthesis Research, 98: 7-11 (2008)). Kimiyuki Satoh’s contribution to the photosynthesis research is mainly concerned with the biochemical identification and characterization of photosystem II (PSII). 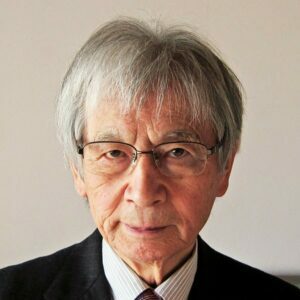 He initiated the work on biochemical separation of chlorophyll-protein complexes responsible for each one of the three chlorophyll-fluorescence emission bands observed in chloroplasts at 77K (Satoh and Butler, 1978). In this study, he succeeded in purifying the PSII core complex from spinach and identified the polypeptide and chemical composition. He demonstrated that the PSII core complex contains two polypeptides of apparent molecular masses of about 30kDa, which eventually were identified as the D1 (herbicide-binding) and D2 proteins (Satoh, Nakatani, Steinback, Watson and Arntzen, 1983). One of the remarkable successes in his research was the isolation of an O2-evolving PSII core complex, which was the first demonstration that O2-evolution could take place in the isolated protein-pigment complex (Tang and Satoh, 1985). Subsequently, his group reported the selective iodination of two tyrosine residues on the D1 and D2 subunits of PSII that may correspond to the oxidative species responsible for the EPR signal IIvf (very fast) and IIs (slow) and functioning as the direct and auxiliary electron donors to the PSII reaction center (P-680), respectively (Takahashi, Takahashi and Satoh, 1986). These proteins were soon found to be equivalent to YZ and YD of D1-Tyr160 and D2-Tyr161 by Babcock’s group (Barry and Babcock, 1987; Debus et al., 1988). A pronounced achievement from his group was the isolation of D1-D2-Cytochrome b559 complex (Nanba and Satoh, 1987). This study established that the site of primary charge separation in the PSII is located in the complex consisting of D1 and D2 proteins, the proteins that are homologous to the L and M subunits of purple bacterial reaction center, and thus greatly contributed to the establishment of phylogenetic relevance recognition between oxygenic and anoxygenic photosynthesis. K. Satoh and W. L. Butler (1978)　Low temperature spectral properties of subchloroplast fractions purified from spinach. Plant Physiol. 61: 373-379. K. Satoh, H. Y. Nakatani, K. E. Steinback, J. Watson and C. J. Arntzen (1983) Polypeptide composition of a photosystem II core complex; Presence of a herbicide-binding protein. Biochim. Biophys. Acta 724: 142-150. X.-S. Tang and K. Satoh (1985) The oxygen-evolving photosystem II core complex. FEBS Lett. 179: 60-64. Y. Takahashi, M. Takahashi and K. Satoh (1986) Identification of the site of iodide photooxidation in the photosystem II reaction center complex. FEBS Lett. 208: 347-351. O. Nanba and K. Satoh (1987) Isolation of a photosystem II reaction center consisting of D-1 and D-2 polypeptides and cytochrome b-559. Proc. Natl. Acad. Sci. USA 84: 109-112. K. Satoh (1985) Protein-pigment and photosystem II reaction center. Photochem. Photobiol. 41: 713-722. K. Satoh (1988) Reality of P-680 chlorophyll protein: Identification of the site of primary photochemistry in oxygenic photosynthesis. Physiol. Plant. 72: 209-212. K. Satoh (2003) Identification of the photosystem II reaction center: A personal story. Photosynth. Res. 76: 133-240. Photosystem II: The Water-Plastoquinone Oxidoreductase.